SEOUL, SOUTH KOREA, March 28, 2019 – The Seoul Metropolitan Government announced that it will open a new public space on the site of the former National Tax Service’s Namdaemun annex, which was used as the Japanese Government-General’s post office building during the Japanese colonial era. Located just across from the Seoul City Hall, it features about 800 square meters of civic square on the ground level and an urban architectural exhibition hall, the first of its kind in Korea, on the underground levels. The Seoul Metropolitan Government said it is meaningful to return this historic place to Seoul citizens for the first time in 82 years. According to the Seoul Metropolitan Government, the former National Tax Service’s Namdaemun annex building was demolished in 2015 and the newly constructed space will officially open on March 28, 2019. It was part of one of the projects to create historical and cultural spaces in Sejong-daero in an effort to clear away the remains of Japanese occupation. The Seoul Metropolitan Government decided to make a space for the citizens in 2015, when celebrated the 70th anniversary of independence of Korea, so as to restore the damaged breath and history of the Korean Empire. The Seoul Metropolitan Government agreed with the then site owner National Tax Service to exchange the city-owned site at the Cheongwadae Sarangchae, a tourism exhibition center to promote the understanding of the presidents of Korea in the past and present and Korean traditional culture, for this new place in February 2014, and completed the transfer of ownership in May 2015. The newly constructed Seoul Architecture Exhibition Center has one ground level and three underground levels with a total floor space of 2,998 square meters. With the aim of “restoring the natural scenery through emptiness,” a civic plaza in harmony with its surroundings was created on the ground level, while Korea’s first urban architectural exhibition hall occupies the three underground floors. Especially, its second basement level walkway is connected to the Citizens’ Hall located at the underground of the Seoul City Hall and the Seoul City Hall subway station in order to create a space where historical and cultural assets are harmonized and to strengthen walking networks in the surrounding areas. The Seoul Metropolitan Government plans to hold three-day events from March 27 to March 29 to celebrate its official opening. The opening ceremony is scheduled to take place at 2pm on March 28. 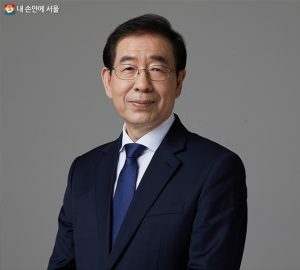 Seoul Mayor Park Won-Soon and domestic and international urban architects as well as around 200 citizens are expected to participate in the opening ceremony.